Sometimes humanity feels very far away. It sometimes feels like people are mean and cruel and you couldn't possibly be part of such an aggressive, torturous breed. 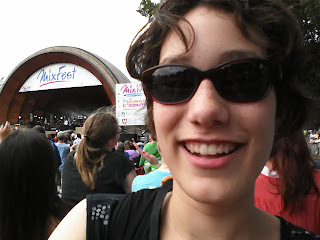 Tonight, though, humanity is closer to me than its been in a while.I just got back from MixFest 2012, an annual concert at the Hatch Shell in Boston. It's free, open to the public and attracts just about everybody. We took crowded trains out and back to the park. It didn't particularly help with the crowding that at the same time this missive concert was occurring a game at Fenway was taking place. Consequentially, the T was as full as ever. We crammed ourselves in more than ever. Three years ago this would have terrified me due to the potential for germs, but I've been healthy for so long I was surprisingly unaffected. 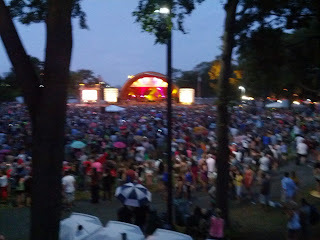 When the T is as full as it was tonight you can't hold on to anything. You have to trust the people around you will hold you up. You have to accept that you will touch the humans around you. Today, at least so far, it was better than alright, but completely hilarious. I made friends with the people around me and we honestly were entertained at a situation which could be crazymaking. We got to and from the amazing MixFest safely. 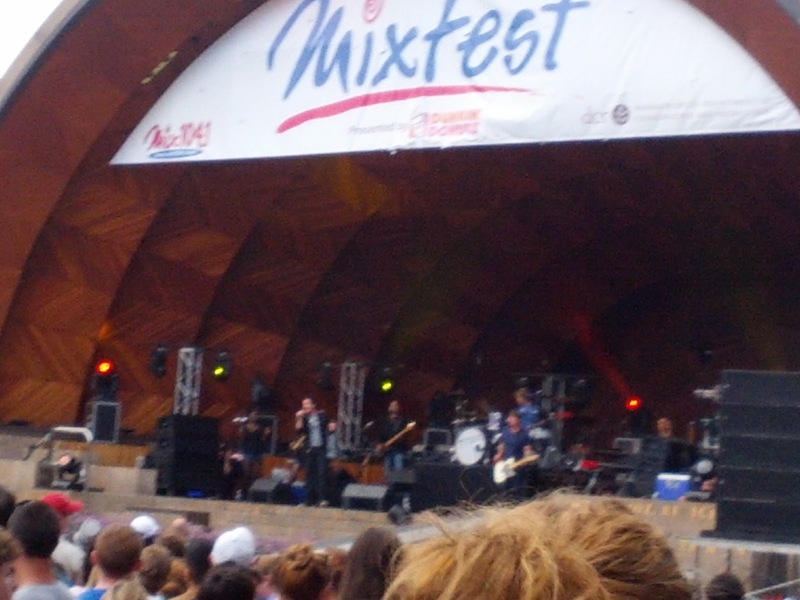 Last year MixFest featured Sarah Bareillas and Michelle Branch. This year it featued Andy Grammar, Gavin DeGraw, and mostly Train. It is enormous. Train is one of those bands that I feel like everybody, whether they like it or not, knows the beats and the lyrics to. The music is catchy, honest, and plays literally everywhere. I happen to like Train and when thousands of people stood around me yelling, "Oh I swear to you, I'll be there for you" I have to admit I was a little moved. I didn't cry or anything, but it made it a little bit harder to remember that most people, when instructed, will administer life-threatening electric shocks and a little easier to remember that someone in this city literally gave me their heart. We were all hot, wet, huddled together, clapping to the same music, and feeling the same music tonight. That's where humanity lies. It seems human to me to tell our neighbors "Together can never be close enough for me; To feel like I am close enough to you." When those words are played in stereo by thousands of lips and engulf me in their sound and meaning all I can think is yes. Between beats of the heart and the drum is where we can feel like we are one group. I am glad I was there with friends to experience the humanity of the moment.